Welcome to the MLP: GK Fanfiction Collab thread. This thread exists to discuss and collaborate about our collective interests in making a body of fanfiction surrounding the lore of the Manehatten setting. The interest this idea has generated has lead me to make a general thread to organize it. Let's avoid taking this to chat as much as possible. We all need the posts and chat can stand to be decluttered right now. Otherwise, we have to discuss, who wins, if anyone. I rather like Onyx's idea about making this a mish-mash of clippings, stories etc from the backstory. 'Course, just writing stories would be fine. I agree. The general consensus here seems to be building around the conclusion that we will stick to side-stories clippings and miscellaniea, that will coalesce to provide a sort of canon-supplement, and who's canon would be apart of but not directly touching any of the canon amongst the site's. We should explore the ideas of seperate settings as well, since we are no longer confined to manehatten. However, I feel that some characters (users) should at least be implicitly mentioned. I would like the separate settings, as I could write about a couple, namely the crystal caverns. However, should it all be one genre, because the crystal caverns would be a bit of horror. Otherwise we could do things like the battles for other cities and such. After all, how would people feel if all of the OCs generated don't appear in the story? While the story should not revolve around the users, there should be some mention. Since there will be no real protagonist if we do the whole WWZ thing, it would make it possible for there to be multiple character appearances since they will only appear once or twice. However, it would appear that the length of "clippings" should vary. However, we should not make all of them super long or super short. A good mix between the two is what we are looking for. So, should we agree that the story leads up to the "present" so to speak? If so, how long should this be? I would say at least 20k words. Otherwise the sky is the limit. If we include OC's than it should be for relevant reasons, and with the permissions of the authors. I'd like to avoid pure fanservice plugs, since it might make the story rather disjointed. At any rate, lets wait for the final canon before running into more detailed plans. I want to know what kind of final material we're gonna end up working with. Like I said, it would mostly be implicit references, like the OC's who we use will at least mention a character or 7. The users won't be the actual storytellers, more like, they will be talked about like Oh, I heard about this one... who... but there wasn't much else to say about it. I agree that finding out what the final lore is is rather important. Its been a long time coming by I realize we really need something like this right now. So consider this project initiated. From the looks of it, we might be able to get maybe four people writing for this. And right now, I think we should just stretch ourselves, get an idea of what we all can do for this setting. So for now assignments. I'm going to write something for GK, and I want anyone interested to do the same. We'll work up some sort of small collection at first, and then let the it grow from there. Thoughts? 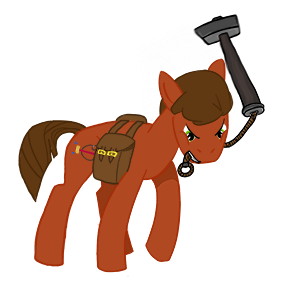 I had a short story about a naval engagement in Equestria I was writing for a while. I got something on the Battle of Stalliongrad, if it's so needed. Huzzah! Go with it. My idea-pan has been runnin' low lately so I need to put in extra effort to think of something. Alright, what do I do with it?